Any of these sound familiar? If so, the cause may lie with you. People’s dominant sides tend to be larger, stronger and more contracted. If one side of your body is significantly stronger than the other, your balance will be affected and you could be sitting much more heavily to one side than the other. Or, you may have an asymmetrical horse and therefore require an asymmetrical horse saddle. But to train your horse correctly, you need a saddle that fits. And if your horse is uneven, how do you manage that? Saddle fitting an asymmetrical horse can be a bit of a challenge, but it’s definitely do-able. The methods used will depend on how rapidly and radically your horse’s back is likely to change, and whether your saddle has foam panels (which can only be minimally adjusted) or flocked panels (which can be changed more radically). The very first thing to do is to make sure that tree width, tree shape and the panel configuration are all correct for the horse’s back. The tree is the rigid frame of the saddle, and the only part of it that can be changed is the width in front, and usually only one size up or down – say from a medium tree to a wide, or an extra-wide to a wide. (Re-sizing the tree is fairly expensive and should not be done repeatedly- it can compromise the strength of the tree so it’s really best to start with a width that’s correct for your horse.) And no matter how you widen or narrow the tree, its basic shape won’t really change, and neither will the panels. So those are the areas that must be correct before we consider compensating for any asymmetries. The next thing to consider is how quickly and dramatically your horse’s back is likely to change. If your horse’s unevenness stems from a long-standing, chronic problem – for example, an older horse with major arthritic changes, or a horse whose gait or build has been affected by a severe injury – chances are the asymmetry will always be there. If your saddle is wool-flocked, the flocking can be adjusted to compensate (sometimes partially, sometimes completely) for the asymmetry. If your saddle has foam filled panels (or if the unevenness is too severe to be corrected by flocking), you’ll be using shims or corrective pads. Like people, most horses have a dominant side and their bodies aren’t perfectly even either. With consistent and correct training, a sound and healthy horse can develop symmetrically, and this should – no matter what discipline you ride – be one of your goals. Shim pads may be expensive initially, but in the long run, they’ll save you money – whether your saddle is foam or flocked. In the case of a foam flocked saddle, it’s going to give you the option of correcting the asymmetry more easily – you won’t be fighting to maintain your balance and your horse will work better, which will help stave off possible soundness issues (and vet bills!). If your saddle is flocked, shim pads save you the expense of a saddle fitter to tweaking the flocking every month or so. It will also help preserve the integrity of your flocking; too much fiddling with the flocking can mean that you’ll need a complete re-flock much sooner than usual. Shims also allow you to adjust the fit as necessary and make room for the growing muscles. Getting the right fit with shims can involve a bit of trial and error. Sometimes what seems like the logical fix … just isn’t. But be patient and persevere; the right combination will show itself. When using shims, I really like the Mattes Correction Pad – I think they’re about the best shim pad I’ve run into. They come with shaped felt front and rear shims that fit into corresponding pockets (2 on each side, front and rear) on the pad. Each pocket will hold up to about 3 shims, so the fit can really be “customized”. The pads are shaped to avoid wither pressure, the fleece wicks sweat, and the pad and shims “breathe” to keep your horse’s back cool. The pad can be used next to the horse’s back or placed over a thin cotton pad; it comes in full or half pad, and you can remove the shims and use it for a little extra cushioning. Given proper care, these pads will last for years. Now, a word about you, the rider. All this work getting your horse and your saddle symmetrical will all be much tougher if YOU are uneven. An asymmetrical rider. Note the dropped right shoulder and raised right hip. Believe me, I know whereof I speak – I am horribly left sided, and so is my mare. We did pretty well going to the left, but to the right … well, on a good day, it was passable, and on a bad day, it was just gruesome. I sat much more heavily on the right, and when I looked at my saddle, my right panel was squished way flatter than my left … a result of my sidedness, and the unevenness prevented me from sitting evenly … a vicious circle. 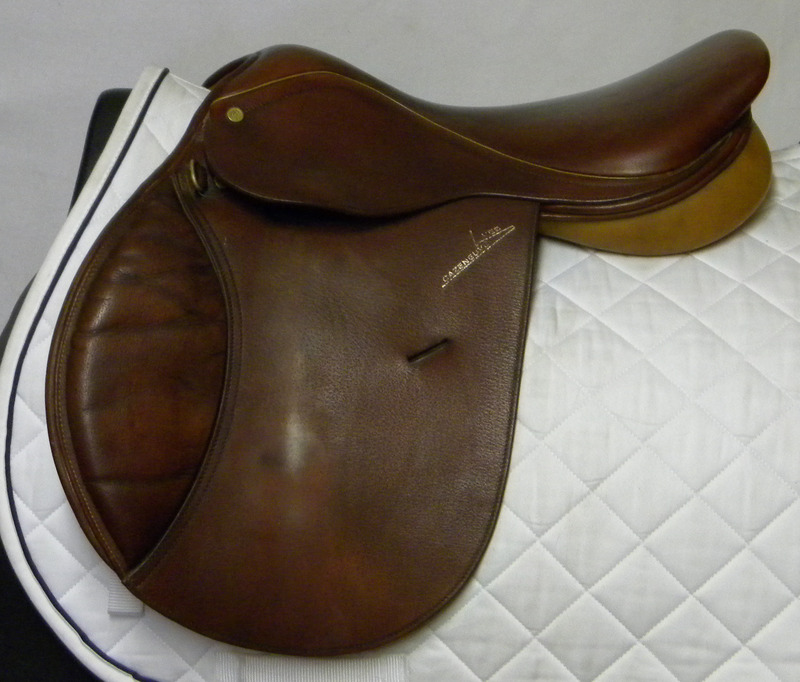 Now, I’m lucky – I was able to re-flock my own saddle, and I started working on my symmetry. It’s been a process – I’ve really had to become conscious of keeping my seat and body even, not just on my horse, but in the car, at the dinner table, at the computer … and it has paid off. Sometimes, work with a physical therapist, chiropractor, or just a good exercise program can work wonders to help your body be ‘the best it can be’. My mare’s more evenly developed now, the balance and effectiveness of my seat has improved, our work to the right is far, far better … and – best of all – the saddle fitter hasn’t had to address that squished right panel again!